Welcome once more to our blog post series, Around the British Isles in a Motorhome. This time we are looking at West Yorkshire which consists of many unique and charming villages and towns including Leeds, Halifax, Bradford, Huddersfield, Holmfirth, Wakefield, Otley and Bingley. Think: Last of the Summer Wine; rolling green valleys and moors dotted with quaint English pubs and steep cobbled hills and you’ve pretty much got a taste of this charming slice of Yorkshire. Put this together with easy access to the M62 motorway, as well as the close proximity to South and North Yorkshire and Humberside, and there’s really not a great deal that you cannot see and do in your motorhome in this popular part of the British Isles. The best known part of West Yorkshire is arguably the city of Leeds which has grown in cultural prominence in the last decade or two. It played host to the Tour de France in 2014; annually holds the popular Leeds Festival and the First Direct Arena regularly houses mainstream artists. The ‘Leeds 10k’ running event runs through the city and there is also the Cla Game Fair at Harewood House. The Royal Armouries Museum in Leeds is a huge multi-million pound building which contains the national collection of arms and armour. The city itself is a pleasing blend of cafes, restaurants, the old Corn Exchange and Victorian shopping arcades. The towns of Pontefract, Pudsey, Shipley and Wetherby sit closely to Leeds and are networked with a good public transport system of trains and buses. Bradford city is another popular destination with all the amenities and offerings other cities enjoy. It also provides a location that is enclosed in idyllic rural landscape. Attractions in Bradford include: the National Media Museum; Alhambra Theatre and there is also the historic Saltaire village which is near Bradford and had been named a designated World Heritage Site by UNESCO. Saltaire features the old textile mill; boat trips; Victoria Hall and the United Reformed Church. Other areas close to Bradford include Bingley and Otley. Another dimension to West Yorkshire lies further towards the Pennines and close to the Lancashire border. There you will find Halifax, Huddersfield, Holmfirth and Hebden Bridge. These stone clad villages and towns lie in the valleys, each brimming with its own unique appeal and history. Hebden Bridge, in particular, is fast becoming a cultural hub of alternative and traditional theatre, music; art performances and exhibitions, including; food and book festivals; folk music gatherings, book launches and much more. Like the other towns in this area, it is surrounded by a swirl of emerald-coloured countryside. Cragg Vale, Hebden Bridge, HX7 5RU. This site is close to Hebden Bridge centre and close to the famous Bronte Parsonage Museum where the inspiration for Wuthering Heights began. 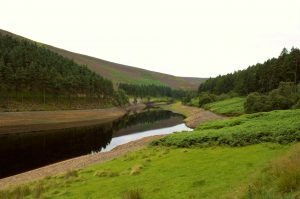 Visitors can enjoy walks along the Pennine Way or Hardcastle Crags. Keighley and Worth valley Steam Railway and ‘The Woolpack’ from Emmerdale are also close by. Facilities at this site include: electrical hook-ups; hard standing pitches and gas refills. Fishing and golf course are close by; there is a shop within one mile and bars and restaurants within a five mile distance. Brandon Crescent, Shadwell, Leeds, LS17 9JH. Facilities at this quite site which is open all year include: hard standing pitches; toilets and chemical disposal. There are also disabled facilities and dogs are permitted on this site. The nearest shops, restaurants and bars are within one mile and there are cycling, golfing, public transport access, bike-hire and horse riding amenities also nearby. It is less than seven miles away from Leeds centre as well as being handy fro trips to Harrogate, Skipton and York. Baildon Moor, Baildon, Shipley, BD17 5EE. This is a long-established site which is situated in the moorlands of Baildon, providing views of the Aire Valley and Shipley Glen. The site offers the following facilities: electric hook-ups, fully serviced pitches; hard standing pitches; washing up and laundry services as well as toilet and shower blocks. There are a range of activities on offer in the surrounding are including horse riding; biking, swimming; fishing; tennis and watersports.